So I was looking through my old video game magazine I got and it mentioned Police Academy for the NES. It had a little blurb and a screenshot under the previews section. I went to NintendoAge for more information and found that there was a completed version made by Steve Woita as well as another, inferior completed version made by someone else. My question is: Has either one been found/dumped? I'd really like to have it on cart for all my other unlicensed Tengen game collection. Tengens Xybots & Hard Drivin for the NES were found and dumped. So that gives some hope that NES Tengen Protos are out there. License to Kill is another one that comes to mind as well. Should turn up someday. Edit: I forgot Airball also turned up, and was dumped. So hey, pretty good track record there. Nice odds. Edited by Supergun, Thu May 24, 2018 9:21 PM. Yeah, I had repros made of Xybots and Hard Drivin'. Apparently Airball can't fit in their custom black shells? It looks like it was going to be based more on the short-lived Police Academy cartoon. The plot involved alternating between the various characters to rescue the commandant's missing goldfish. I really liked the cartoon and had all the action figures too. From Steve Woita's version, there is only one prototype apparently in its possession, it was almost complete (NES Warp Zone), this game included static screens where you had to collect donuts or items with a cursor. 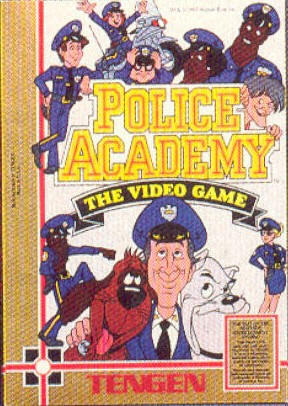 The second "Police Academy: The Video Game" is a clone of Super Mario Bros. 2 and was also close to being complete, Bill Hindorff worked in this (NES World). Of Tengen also this Technocop programmed by Domark, which apparently was finalized. R.B.I. Baseball was announced for PlayChoice-10, but was only released for the VS System. also this Cyberball, was also going to be released by Tengen but was released by Jaleco in 1992. Dont forget Mindscapes Paperboys, Road Blasters, 720, and Gauntlet II. Not to mention Milton Bradleys Marble Madness. But most of the Genesis versions were absolutely awesome. I played the hell out of Paperboy & Roadblasters. Gauntlet was also spot on. Even had the extra adventure mode. And the REAL marble madness (tengen mega drive version) is perfect. One of these 2 Police Academy games is sure to turn up eventually. Surely someone out there still has it, they just dont realize it. Would love to see Police Academy or License to Kill turn up one day. I'm pretty sure Steve Woita has the version he worked on in some form or another, but he can't/won't release it for legal reasons.